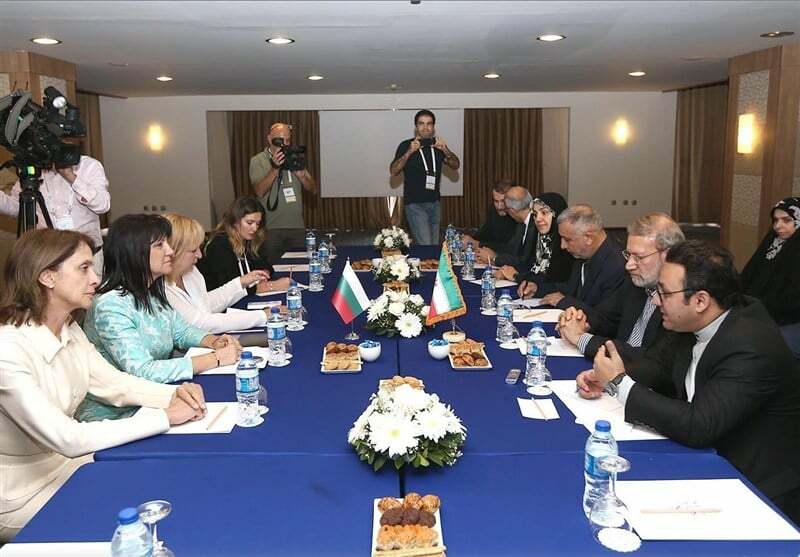 Iranian Parliament Speaker Ali Larijani called for setting up a joint fund with Bulgaria to boost bilateral trade interaction. In a Tuesday meeting with his Bulgarian counterpart on the sidelines of a conference of Eurasian states’ parliaments in Turkey’s Antalya, Larijani stressed the need for implementing the idea of establishing an Iran-Bulgaria joint fund to support the two sides’ production and expand trade ties. Iranian private sector companies can help Bulgaria in the heavy industries, Larijani said. For her part, the Bulgarian speaker, Tsveta Karayancheva, said ties with Iran are top on the agenda of the European Union, adding that her country seeks to employ Iran’s transportation capacity and corridors. Accompanied by a delegation of Iranian lawmakers, Larijani took part in the 3rd Meeting of Speakers of Eurasian Countries’ Parliaments in Antalya. The conference was attended by 20 parliament speakers and parliamentary delegations from 17 Asian and European nations. The first and second editions of the conference were held in Russia and South Korea, respectively.